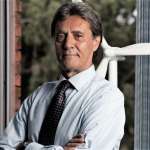 Carlo van Wageningen is one of the founding fathers and director of the Lake Turkana Wind Power Project in Kenya, the largest wind farm project in Africa. The Lake Turkana Wind Power Project involves the development and construction of a 310 MW wind farm with 365 wind turbines of a capacity of 850 KW each. The project will provide clean and affordable energy to Kenya’s national grid (i.e. approx. 17% of the country’s installed capacity) and contributes in filling the energy gap in Kenya. The Lake Turkana Wind Power Project is an inspiring example of a strong Private Public Partnership. Carlo was born in Rome, but has lived in Africa for a large part of his life. Carlo worked for the Food and Agricultural Organization (FAO) of the United Nations and World Food Program. He was stationed in Rome (Italy), Niamey (Niger), Cotonou (Benin) and Harare (Zimbabwe) in various capacities. In 1988, Carlo decided to make a career change into the private sector. He was posted in Nairobi (Kenya) as director for Africa for FATA EUROPEAN GROUP, an important Industrial Engineering Company based in Turin (Italy). In 1993, Carlo decided to undertake his own business activities as an entrepreneur, his initial ventures in the manufacturing industry bore fruits and he carried on investing in Kenya until the present days where he still lives with his family. Today Carlo’s investments in Kenya vary from a major shareholder in a Private Bank, owner of a Chemical Indent Company (ANSET INTERNATIONAL), shareholder of a Project Management and Development Company, (ANSET AFRICA Ltd) and shareholder in KP&P AFRICA B.V., owner of the Lake Turkana Wind Power Project.